Clean your hair using shampoo no conditioner to be used. Dry your hair. Make a thick creamy paste using warm water and contents of the packet. 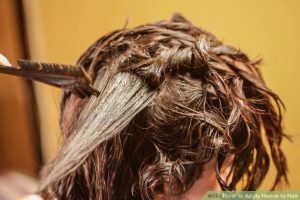 Apply covering each strand and keep the mixture for one hour(90 min to 2hours for very resistant hair and dark tones). Cover with a shower cap. Rinse the colour out of your hair until water runs clear. Use only conditioner to untangle your hair. For deep and long lasting colour it is best to shampoo after 24 hours. For good results repeat once a month.